Extreme Wide Field of View: The Extreme Wide Field of View allows for a 20% increased Field of View enabling fast target engagement and situational awareness. Dy Nitrogen Purged and Sealed: Utilizing Nitrogen gas, the optic is purged and sealed to ensure optimal performance in all weather conditions for the life of the optic. Riton HD/ED Glass: The Riton High Density (HD)/Extra Dispersion (ED) glass delivers 99.5% light transmission with extra low dispersion for an enhanced color spectrum. This high quality HD/ED glass provides optimal clarity and an improved sight picture. Riton Rugged Construction: The Riton Rugged Construction incorporates the application of 6061-T6 aircraft-grade aluminum, CNC machined one piece tubes, and Type III Hard Coat Anodize. 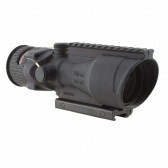 These industry proven materials and process ensure the protection of the optics through the most rugged applications. Precision Quality Assurance:Every Riton product goes through a rigorous quality control process by a certified technician in Tucson, AZ. Each product you receive has undergone a thorough dual inspection process, being tested and inspected twice prior to making it to you. Riton Performance Coating: Incorporating proprietary fully multi-coated lenses, all Riton optics feature low light enhancement, full wide band, anti-scratch and anti-reflective coatings for increased light transmission and overall lens performance. Riton Advanced Turret System: The Riton Advanced Turret System incorporates push/pull locking turrets, as well as windage and elevation reference indicators for repeatable tracking and accuracy. Riton HD Glass: The Riton High Density (HD) glass delivers 99.5% light transmission for enhanced clarity and optimal sight picture.